Craig has a good life, he goes to a top school in New York, has a loving family and a good group of friends. Craig is also depressed. After deciding he doesn’t want or need to take his medication any more, a few nights later he decides that he’s going to kill himself. But something stops him that night and he finds himself checking into a psychiatric ward and into a completely new world. To get better a lot has to change and Craig has to get to know himself. There are books in life that somehow just explain your life. They make you feel like you’re not alone and you’re not as crazy as you thought you were. For me, It’s Kind of a funny story was like that. I’ve only ever read one other book that understood how I felt was The Bell Jar by Sylvia Plath. You see, Vizzini’s main character Craig is a perfectionist, he wants success and if one thing goes wrong he spirals he starts to ‘cycle’ which, if you’ve never experienced it is a bad thing. Thoughts keep coming and coming until you can’t think straight,sometimes you feel like you can’t breathe. His high ambition and determination takes over his life to the point that the majority of his cycles are about the work he’s going (or lack of it). A few people have criticised some of the actions of the teenagers on the ward and I’ll admit that, at first, I was sceptical and thought could things like this really happen? Then I remembered I was reading about teenagers, and I think that’s something you have to keep in mind while reading this novel. Craig isn’t an adult and while some of the things he struggles with might be hard to understand as an adult I can fully remember these feelings and emotions as a teenager myself. I can fully praise this novel for its portrayal of what it’s like to have a mental illness as a teenager and also for reiterating that you should never just stop taking your medication. I don’t think I’ve ever been able to read something and just feel every bit of what the character is going through; the anxiety, the need to achieve, thinking that you can handle everything when in fact you’re only slightly getting better and last but not least finding a creative way to release all the frustrations. The reason that Vizzini can write this so well is because he himself has lived it. 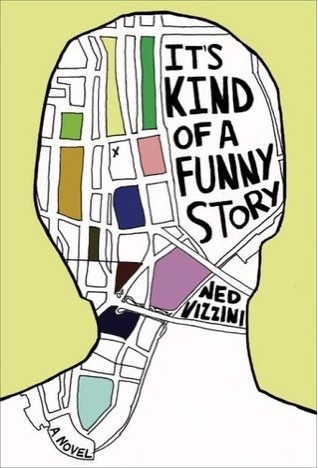 Like Plath’s novel, Vizzini’s is semi autobiographical; he was in a mental health unit as a teenager. On a personal level, I don’t think that experience ever truly leaves you. I’m inspired by him and incredibly saddened to learn that he took his own life a few years ago. I want to give this novel five stars *****. This really is something else, not only is there a positive portrayal of young people with mental health conditions but also of teenagers in general. Craig does nothing wrong except try, and I think that’s more common than a lot of people realise. People with mental health problems can have a perfectionist side, which without help can take over, I certainly know mine does. I want everyone to read this because it is amazing, educational and I found that it really gave me some hope and someone to connect with. Go and pick a copy up now!